I had no idea I'd missed a grand tradition a couple hundred posts ago. Jenn, newish to the blogging world (and super fun, visit her! After you read me...), recently announced her 100th post and wrote a very cool, introspective list of 100 things about herself. I WANT TO DO THAT. And so I am, even though this will be Post #331. Because I make the rules around here. [Plus this will keep me from watching any more True Hollywood Stories or looking up facts about Xzibit and Crip Walking and Ice T's wife]. I was born in a Navy hospital on Whidbey Island, Washington. The building that housed the hospital became my kindergarten. When I went to community college, I took a class in that same building. My great-grandparents came to Whidbey from Holland. My grandma Minnie didn't have a middle name. I considered [asking 1st husband about] naming our daughter "Minnie." Before we had children, husband & I had two dogs - Sally, a beagle and Rosebud, a basset hound. I met 1st (so far only) husband at Washington State University, when our dorms were working together for Homecoming. He was in my top 3 on the list of Cute Guys to Stalk Check Out. I waited to see what project he was going to work on before I chose a group. (We made a fireplace for the yard display). We used to go dancing nearly every weekend at a Pullman club called Panic City. You will probably never see me dancing. I once danced on a picnic table by the Snake River in Idaho. I drank entirely too much in college. The most ill-advised beverage I ever consumed was grape-flavored Mad Dog mixed with Dr. Pepper. Death wish in a cup, my friends. I never consumed alcohol before college. I painted an awesome Opus in a shower cap outside the bathroom in my dorm. (It was supposed to be an homage but now it just sounds like copyright infringement). My best friend from high school was my roommate at WSU. For one semester. (We're still friends, likely only because we stopped being roommates). I still have a pair of jeans I wrote & drew on during my freshman year. They are on display in my classroom. Unbelievably, they still fit me [as of this writing in 2008]. [Edited in 2017 to add, nope]. There is a drawing of Opus on the jeans, too. (Oh hey again, copyright infringement...). I had crush on my student advisor at WSU who was smart and cute and reminded me of Michael J. Fox; he thought I was a complete idiot for skipping classes. My parents met while drag racing their Road Runners. My mother got out of at least two speeding tickets because she knew the cops from high school. I have never gotten out of a speeding ticket. I did get out of detention because I was late getting there and the teacher locked the door. I had enormous fear that I would not get my diploma because I missed that detention. I got the detention because I had left campus during lunch to get balloons for my Economics teacher. He was turning 40 and our class planned a surprise party for him. I did not actually like my Economics teacher, or Economics. My favorite teacher ever was Mr. Barker; he taught 11th grade American Literature. We read One Flew Over the Cuckoo's Nest then watched Cool Hand Luke. I was a changed person; I think of Mr. Barker every year when I teach that novel. I still have poems I wrote in Mr. Barker's class. My next favorite teacher was Mr. Carroll, who taught College Prep English and wrote a kind message in Gaelic in my yearbook. Mr. Carroll asked me at least once a week if I was stoned, because my pupils were so dilated. I have never, ever smoked anything. My decision not to smoke had less to do with health risks and more to do with the certainty that I would cough and hack and look like a fool. My grandpa quit smoking cold turkey when I was around 4 years old and would pop Pep-O-Mint Lifesavers, calling them his cigarettes. I frequently asked for "cigarettes" from my grandpa, in public. I loved hanging out in my grandpa's wrecking yard, up the hill from their house. When I was about 3, I slid off a big rock in the wrecking yard and busted out my front teeth. Surprisingly, I don't have a problem with dentists. I wear a night guard to keep from grinding my teeth while I sleep. I broke my first night guard by throwing it at the bathroom counter when I was mad at 1st husband. I had to wear headgear every day for a year in high school before getting braces for 9 months. When you first get headgear, you're not allowed to wear it to bed. I got mine right before a band trip to B.C. Guess what I wore on the 2 hour bus ride? I was part of a student exchange (to Canada) my sophomore year of high school. I got into an argument with a classmate about how to say "jalapeno." She insisted it was "hal-uh-PEE-no." I still don't really like her. [Edit, 2017: Nope]. I made it to the Regional level of our state's Spelling Bee when I was in sixth grade but missed the word "salve." My sixth grade teacher called my mom to chastise her for letting me get away with a breakfast of Pop-Tarts and orange juice every day. I have not made any phone calls to chastise parents of students. I do chastise students for not eating breakfast, but I'll accept Pop-Tarts and orange juice. I keep lots of granola bars for students in my cupboard at school. My current favorite granola bar is the Trader Joe's Nutty Chocolate. The first major roller coaster I rode was Big Ben in Six Flags Over Texas with my dad when I was 8. 1st husband & I are planning to take a roller coaster-riding vacation when the kids are older. I have been to three World's Fairs - Spokane (1974), Knoxville (1982), and Vancouver, B.C. (1986). I don't remember much of anything about the World's Fairs I visited. I am was rabidly planning to attend the 2010 Winter Olympics in Vancouver, B. C. [But we didn't]. I do not usually participate in or regularly follow any of the sports featured in the Winter Olympics. I harbor an irrational feeling of irritation that Vancouver, B. C. gets all the "Vancouver" attention when our Washington town is the original. I am a terrible caretaker of plants. In college, future 1st husband left a lovely, lush ivy plant in my care for a summer; it crumbled to dust when he came to retrieve it. He still talks about it. The drug store where I worked throughout college was owned by Jack Beach, whose son Pat played in the NFL (for the Colts then Eagles then Cardinals). I got to see (and hold!) Randall Cunningham's wedding invitation sent to Pat Beach. Pat Beach now lives in my hometown. (I guess this isn't technically a fact about me, unless you count that I am abnormally obsessed with the goings-on of others). I have seen Prince, INXS, Roy Orbison, Alan Jackson, Three Dog Night, Black Happy, Fountains of Wayne (of course), Rush, Joe Satriani, Sammy Hagar, and R.E.M. in concert. I took future 1st husband to the R.E.M. concert and bought him a tank top because he fixed my car. The muffler of my 77 Honda Civic once partially detached and dragged noisily through Greek Row at WSU. I think I may have cried all the way to my apartment. I remember crying all the way through Pirates of the Caribbean when I visited Disneyland for my 5th birthday. I've been to Disneyland six seven [as of 2015] times. My favorite ride is Space Mountain. My favorite attraction, now blasphemously replaced by Winnie-the-Pooh on LSD, was the Country Bear Jamboree. I developed a James Dean obsession in college. I had a crush on a guy who performed a monologue as James Dean for his acting class. That guy was working the desk at the hotel where 1st husband & I stayed the night before our honeymoon. He remembered me when we were checking out. Little bit weird. On our honeymoon we took a cruise to Catalina Island & Ensenada, Mexico then we went to Disneyland. Tulips are my favorite flowers but I don't like to get them because they wilt and die so quickly. I picked & bundled flowers one summer in the Skagit Valley. It was shockingly difficult and intense. I have also picked strawberries, bulbs, cucumbers, and potatoes, for very little money or glory. I used to enter lots of things in the Island County fair - my button collection, pictures I colored, a slingshot (made with my grandpa), blueberry buckle. I did not hold a library card until after I was married. I seriously considered becoming a librarian. I seriously considered trying out to be a cheerleader in high school. I am still haunted by how mean I was to some classmates when I was a kid. I taught life skills & GED prep at a group home for adjudicated youth in Portland. One of my students there made me my first-ever Mother's Day card. I am trying to make more cards using the photos I take. I would love to own a bookstore, if someone else would deal with the finances. I have never prepared taxes as a married person. I have never mowed the lawn as a married person. I adore being married (since 1993!). 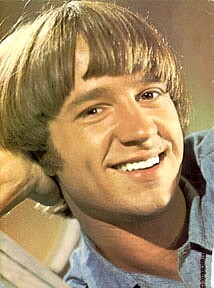 I desperately loved and wanted to marry Peter Tork & Michael Nesmith from The Monkees. I still have a cardboard record of "I'm A Believer" cut from the back of a Honeycomb cereal box. I read aloud (to my kids & my students) nearly every day. "I wear a night guard to keep from grinding my teeth while I sleep." " I broke my first night guard by throwing it at the counter when I was mad at Stu." I just fell in love with you, but I guess I'll have to get a job at Wild Oats if I want you to notice me. Tulips are also my favorite flower! As a matter of fact, I just bought some at the grocery store yesterday because they were on sale for $6.99 for a dozen. They are an orange color. I also have never done taxes or mowed the lawn as a married person. Okay, I've never mowed a lawn ever. be prepared with my chocolate when I meet you. I will recall facts victoriously. No libraray card?! Totally with you on the taxes, lawn mowing, and Space Mountain. Six Flags over Texas??? YeeHaw! Come back and we'll go! see. I LOVED Country Bear Jamboree. I even had the record. It was the first one I owned by myself. I can still sing the songs on it. Completely impressive. I'm not sure that I could come up with 100 items like that! Your jeans from your Freshman Year still fit you?! You-are-so-my-idol. hahahahaha. the strikeout scrolling, oh that was good. i totally read it all though. i swear. I think you will owe me chocolates. My dh went to WSU (sorry, my kids are mixed breeds; I went to UW) and we have family in your Vancouver. Sadly, we are far away. I've seen you out and about in the blogs and am finally delurking here! You are just welcome to be a cheerleader in the IPL too. You are so fond of dancing. That's exactly what needed. "I am still haunted by how mean I was to some classmates when I was a kid"
Same here. I could definitely relate to most of what you have written here. I think I'll also make my 100 list when I reach 100 post in my blog. Weird enough we have 22 things in common. I think I'll do one of these for my own blog.